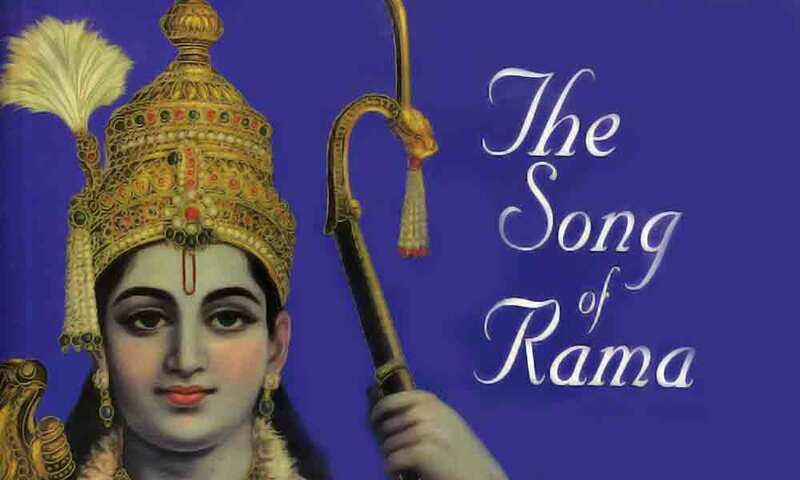 The Song of Rama Ever since Sage Valmiki composed the Ramayana many thousands of years ago, there have been many versions of the epic, rewritten and reinterpreted by scholars from various parts of India. So popular is the epic that the story of Ramayana is the most well known ancient epic story not just in India but the entire Asia. Along with Buddhism and the ancient trade routes, it traveled to various parts of the world to became an integral part of the native traditions of many other countries as far as Japan. There is no exaggeration in saying that on the world stage, in the literary history of any country, past or present, there is no other epic, of such grandeur, poetic beauty, expansiveness of human vision and elevation of human thought, as the Ramayana which has been written and rewritten so many times, in so many ways, in so many languages, in so many parts of the world and over so long a period of human history. No other epic attracted the kind of attention and acceptance on a scale as the Ramayana from people of divergent backgrounds, races, traditions and cultures. Those who came after Valmiki and recomposed the epic in their own ways, did so for altruistic reasons, driven not by the desire to prove their scholarly merit, but by an intense passion to express their deep devotion to God in the form of Lord Rama and their admiration for the ideals he symbolized. The Ramayana has always been and perhaps will always be an expression of man's devotion to God and his admiration for the perfect human being as personified by Lord Rama. Whether it was Tulsidas, or Kamban, or the famous Telugu poetess, Molla, the above was true. Whether it was composed in Sanskrit or in any of the multitude of the native languages of India, all the authors, past and present, who attempted to rewrite the Ramayana in the traditional form were undoubtedly champions of truth and followers of Lord Rama. They believed in the ideals of human life and the importance of righteousness and respect for tradition in the conduct of human beings. They were intuitively aware that life and character of Rama symbolized the ideals of humanity for the people to follow. Men of great integrity and inner purity, with unflinching faith in the triumph of truth over falsehood and the divine nature of man, the very thought of Rama filled them with deep devotion and positive emotions. They believed in the spiritual value of the epic, its ability to hold the attention of the masses and its capacity to transform their lives. For them the composition of Ramayana was an opportunity to become infused with the thoughts of God, meditate upon Him, speak to Him, visualize His form, contemplate upon His deeds and spend their time fruitfully in doing a meritorious work. Besides, rendering the great epic into a composition was a service to the world. Obviously, the book, the Song of Rama by Devi Vanamali is borne out of similar motives. It is written out of intense devotion and veneration for Lord Rama as is evident from the selection of words and the style of her expression. In line with the true tradition of her predecessors, Devi Vanamali has presented the Valmiki's version of Ramayana with the humility of a true devotee and the simplicity of the truly detached. Her language does not interfere with the pace of the narrative and her style is unaffected. She portrays Lord Rama both as a warrior king and as a divine being with a human heart. The book is not a mere translation of the Valmiki's Ramayana. Although it draws its content mainly from the latter, the author has included some stories from "the wealth of oral tradition." The story of Ramayana generated a lot of controversy in the past, partly because of the inherent inconsistencies in the narrative and partly because of some contradictions in the character and actions of Rama Himself. To the erudite and scholarly, who are driven more by reason than by devotion, Lord Rama is a bundle of contradictions and weaknesses. To the devoted and the faithful, however, the deeds of Rama are as mysterious and enigmatic as those of God himself and should be construed not as the foibles of Lord Rama but as the play of God. In the Introductory chapter of the Book, Devi Vanamali tries to resolve some of the controversial points using some arguments and explanations. As the author of a book on the Ramayana and as a humble devotee of Lord Rama, perhaps she must have taken upon herself the responsibility to clarify a few issues. Whether we agree with these arguments or not, creation itself is full of inherent contradictions and the human mind is incapable of resolving the moral dilemmas of our lives to the satisfaction of all. Limited as we are, we lack the all encompassing, holistic vision, in which all differences and contradictions resolve themselves harmoniously into the one indivisible whole. To the rationale mind, God Himself is a bundle of contradictions and so is His creation. We see the contradictions of our existence everywhere because we cannot see the truth as it is, without the filters of our consciousness. The problem is much deeper than most of us assume. Our instruments of knowledge, the senses, are not perfect and judgment is clouded by our own perceptions. It is how we are created. It is the way our minds work. We cannot see the whole truth but only its divisions and aspects. We cannot measure truth without comparing and contrasting and without reference to another. We cannot comprehend truth all by itself, but only in parts. This fragmented vision is responsible for our problems and suffering. When God incarnated upon earth willfully in the form of a human being, as Rama, to exemplify the the ideals of human life, He also suffered from this divided vision. If there is one incarnation of God, in which He did not perform any miracles or displayed any superhuman powers, but lived like an ordinary human being, susceptible the same human emotions and frailities, it is His incarnation as Rama. This is the moral of the epic Ramayana. In the story of Rama is hidden the moral that we should be aware of and guard ourselves against the foibles of human personality and the limitations of human consciousness by taking refuge in the dharma or the eternal law of God. The Song of Rama breaths fresh air into age old story of the Ramayana. To the western readers who are not familiar with the story or the characters of the Ramayana, this book offers a chance to know the many hues and dimensions of the original epic. To those who want to refresh their memories of the epic this book offers a good alternative. Finally to all of us who are interested in the spiritual possibilities of human life, this book offers an opportunity to spend some quality time in the contemplation of God and filling our minds with spiritually powerful and mentally positive vibrations.